Using land-based observation stations and the RXTE satellite (which specializes in observing high-energy events), Sivakoff and a team of researchers were able to predict a black holes giant plasma belch to within a day of the event. The belch is actually a bipolar jet of plasma (ionized gas) that discharges particles from the centre of an accretion disc (a structure that moves material toward its centre  in this case, the black hole). This galactic belch ejects particles, scattering them amongst stars and planets, and may also affect magnetic fields in the galaxy. Sivakoff says that by exploring their sample black hole, H1743-322, he and his team hope to explain why the black hole launches gas jets and explain their relation to the accretion discs. They hope to clarify some of the jets effects on the formation and development of the galaxies in our universe. This particular black hole is optimal for study because it launches gas jets about every eight months. Understanding this objects digestive troubles may help answer questions about these incidents. The black holes meal is preceded by a burst of X-ray energy that emanates from the disc and lasts through the entire serving. This burst, while not evident to the naked eye, is easily captured by satellite RXTE. 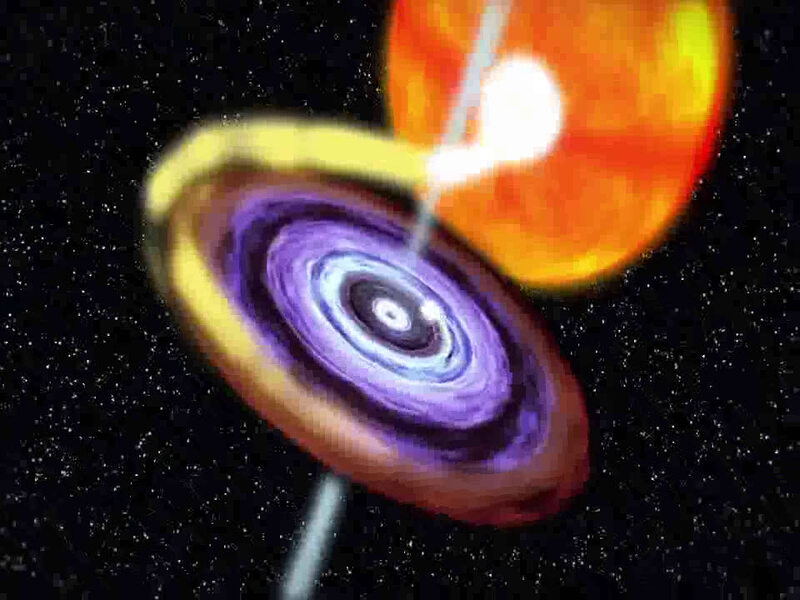 The teams research found a pulsation in the X-ray light, as if the disc were humming a note. An instability in the disc leads to it dumping material  the meal  into the black hole. That material moves inward and orbits the black hole faster, which Sivakoff says is the likely cause of an increasingly higher-pitched tone that his team could hear coming from the disc in the days leading up to the hole launching its plasma jet. Once the jet had ejected, the pulse fell silent. Sivakoff says that how plasma jets are launched remains a mystery, so tying the oscillations with the launch would be a big clue toward understanding the phenomenon. Its beginning to look like these things are very closely connected, he says, adding that his teams recent prediction is the most accurate determination yet of when jet ejecta would be launched from a stellar-mass black hole. In contemporary theory the black hole cannot "burp", i.e. to eject its matter by itself. Black hole is actually defined so. It can only eject portion of matter falling into it from accretion disk round it. I still don't see any connection to Big Bang model here, the need of some reformulation of it the less. It just illustrates, even the mainstream physicists don't believe in it too much. Yes, but there is a difference - at the case of black hole jets these jets always originate OUTSIDE of black hole, whereas at the case of other massive objects they're formed INSIDE of objects. Any other model would need to reformulate the existing theories, the general relativity in particular significantly. Because in relativity the information, energy and matter cannot leave black holes in other way, than via Howking's radiation. In AWT the event horizon of black holes works at the principle of total reflection phenomena, being formed with sharp gradient of vacuum density around black holes. I.e. in similar way, like the water surface, which is bouncing the light back again, when it's illuminated from underwater. In this sense it's behaving like the reflecting mirror, which passes only the light waves of sufficiently long wavelength (Hawking radiation in common sense). At the case of rotating black holes the gradient of vacuum density is decreased at poles, so that the total reflection may not apply here and the light may pass freely through it even at shorter wavelengths. 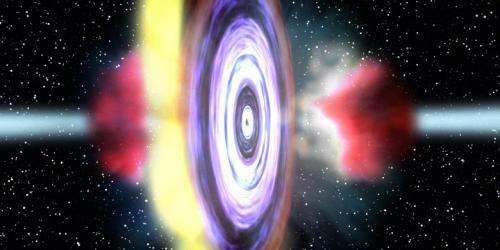 The photons escaping the black hole are materializing outside of it into material of galaxy. In this sense the polar jets of black holes are behaving like the pair of gigantic fountains, which are forming the flat shape of galaxy gradually. rawa, I wouldn't worry too much about the two sentence caption under the pretty picture at the start of the article, it is just a rhetorical flourish and not a statement about science. You are of course correct that the jets originate outside of the event horizon. I thought the jets are caused by charged particles being caught up in magnetic fields embedded in the accretion disc just outside the event horizon. Charged particles would tend to move in a spiral pathway along the lines of magnetic flux. Where those flux lines point away from the event horizon the charged particles would be dragged around and accelerated so their inertia would result in a centrifugal motion. The effect is a bit like some water in a piece of hose pipe a person swings around her head. The water will spray out in a tangential pathway. While the matter in the accretion disc is fairly thinly spread the flux lines will be relatively well ordered and those at the 'north and south poles' will project steady streams of plasma at significant proportion of the speed of light. When denser patches of material reach the vicinity of the event horizon there will be tidal stretching and variations in heating from compression and friction. This will result in varied magnetic fields producing pulses of radiation at ever increasing frequency as the embedded matter spirals inwards. Turbulence and the Coriolis effect should eventually cause the previously calm arrangement of flux lines to pick up much of the denser material and spray it every which-way in the explosive 'burp'. Indeed NOT the Big Bang, but probably one hell of a light show for the neighbors! Reminds me of an inverse variant study of z^2 in terms of electron orbitals. "I thought the jets are caused by charged particles being caught up in magnetic fields embedded in the accretion disc just outside the event horizon." While these observations are consistent with MHD models of jets in accreting black holes, they are not a "proof" of this mechanism, but an indication we are on the right track. Anyway here's a spin-related possibility: as BHs injest matter/antimatter particles charges are split up and likely collected in concentric bands around the event horizon. This would be for BHs with spin acting like a centrifuge. The higher the concentration of these bands the more repulsive like charges become until the repulsive force becomes so high that the bands overcome the gravitational force and are ejected.